Increase in healthcare expenditure across the globe by developing and emerging nations are changing the scenario of healthcare sector in order to provide better and effective cure. Emerging economies are adopting advanced therapies and healthcare devices to minimize the burden of diseases which is further cutting down the figure of health expenditure. Further, introduction of electrically operated negative pressure wound therapy with the purpose to cater cost-effective and better wound care to the patients and beneficial for the physicians to provide effective cure. 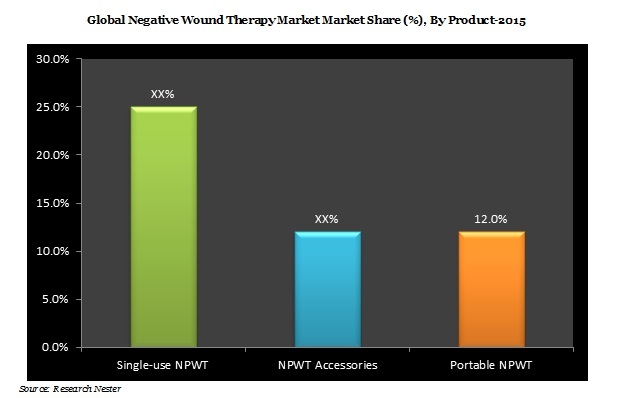 The market of NPWT is majorly driven by the factors such as introduction of advanced NPWT those are more effective than the conventional wound therapies. Rapid growth in healthcare sectors owing to increasing investments in research and development aims to provide affordable and portable user friendly devices. These factors estimated to swell the demand for NPWT in near future. Further, rising awareness towards healthcare and introduction of favorable re-imbursement policies by the government organizations across the globe are likely to shift the consumer to adopt advanced technology of healthcare such as NPWT. The negative wound pressure therapy market is estimated to expand in terms of demand in near future owing to growing awareness towards cost-effective wound therapies and positive growth in GDP figure in developing nations. Increase in aging population is predicted to triggers the prevalence of chronic diseases such as diabetes, mellitus, etc. which leads to chronic wounds, rising cases of skin ulcers due to lack of awareness towards hygiene, growing awareness towards advanced healthcare therapies are some of the factors driving the market of NPWT across the globe. In addition to this, factors such as introduction of cost-effective and portable wound therapy devices, availability of user friendly and disposable NWPT devices, rising preferences by physicians towards NPWT are some of the key elements prompting the demand for negative pressure wound therapy over the forecast period i.e. 2016-2023. Moreover, increase in gross disposable income of the population in developing regions and increasing healthcare spending owing to growing concern towards cure and treatment of wounds, low maintenance cost of mechanical wound therapy equipment are some of the major key elements swelling the demand for NPWT. However, high cost of treatment by NPWT, lack of awareness in under-developed nations, presence of complexities with NPWT devices, availability of low cost substitute therapies and lack of skilled healthcare physicians are some of the factors likely to restraint the market of NPWT market across the globe.